After three long months of being forced to find other entertainment, we finally have the Internet at home! I have missed you, Blog! ...But do you know what I discovered while I was away? I even went to the library. My dad gives me lots of recommendations, and I generally just don't read them because I've resigned myself to motherhood, which of course means there's no time to read. Then one day, in the midst of a messy house and one of my completely frazzled, my-life-is-hard pity parties, I got rebellious and picked up a BOOK. 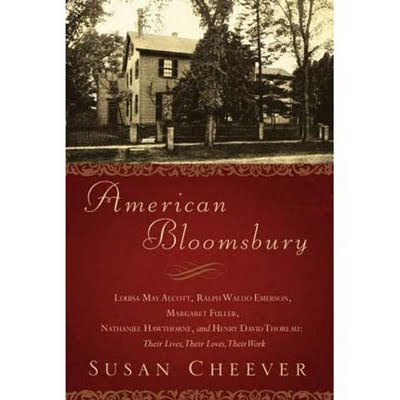 I read American Bloomsbury by Susan Cheever. This book was sitting on our shelf because it was required reading for one of Steve's college courses last year. He had read it for class and told me how amazing he thought it was, so I had been meaning to read it for ten or eleven months now. The book is about the American classics' authors: Louisa May Alcott, Ralph Waldo Emerson, Margaret Fuller, Nathaniel Hawthorne and Henry David Thoreau. Apparently they were all friends, who sat and ate and talked together for hours and hours, living just across the street from each other! It was a fascinating read, all about how they interacted and cared about each other. Oh yeah! I love reading! Anyway, my dad suggested once that I should read Anne Tyler. He said she's a master at character development, and he believes she would be very similar to what I'm going for as a writer. At the library, I discovered that Anne Tyler has almost an entire shelf to herself - apparently she's done a lot of writing! I picked up several books before I decided on one, The Amateur Marriage. 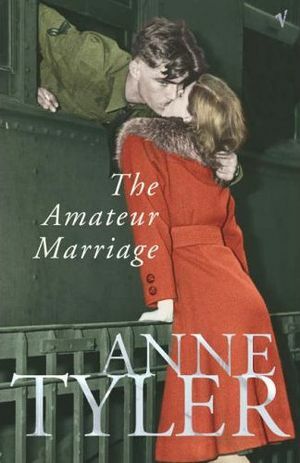 I was drawn to it because the teaser said it was about a mis-matched marriage, rushed into because of the war (WWII), in which two completely opposite personalities struggle to make marriage work. It was absolutely inspiring, the way she was able to convey such natural emotions and everyday thoughts and experiences in an intriguing, heart-wrenching way... the character development was incredible, and the story was eerily close to my own life. More than once I had to put the book down and breathe before I could continue reading, because it felt so real and emotionally-charged. Now that I am finished with that serious, "grown-up" book (as Jenn calls them, lol), I'm diving into a YA series that Jenn and Andrea (you know, those crazy girls I write with at OnceUponADistraction!) 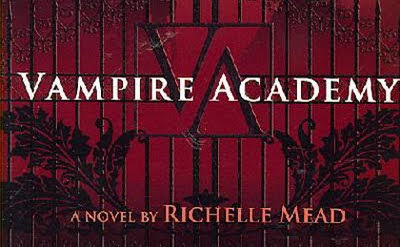 have been raving about for a year now, Vampire Academy by Richelle Mead. 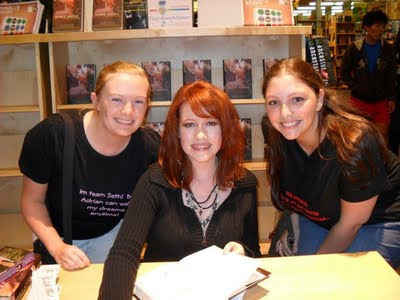 Last year Jenn & Andrea traveled to Portland to meet Richelle Meade, so I figured there's got to be something to it! I'm about halfway through the book now (I'm not a very fast reader), and I'm finding it a wonderful contrast (recovery period) from the intensity of Anne Tyler. I think I'll keep up the "grown-up", young adult book pattern, just to keep myself from sinking into the depression I'm prone to. Well, I'm off to do all the important (boring) stuff I've been waiting to do on the Internet... pay bills, look up phone numbers, check bank acct., etc. I'm soooo excited your reading VA!!!! Woot! I love you!! And miss you so much! I only find myself reading while I have the kids out in the yard. I really should be joining in on that game of tag, but dipping into a juicy story is sometimes just a little more interesting for me. It seems to be the only time I can squeeze it in, other than the time I spend on my computer. I'm so glad you're finding time to read again! I, too, have been sneaking time away from productivity to read now and then and can't help but wonder why it feels like I'm being over-indulgent. It's so worth the time out! We definitely deserve it.